Is your child coughing all the time, especially at night? Your child may have asthma. Don't panic. Don't google it. Make an appointment to see us. Many times you may not actually hear a "wheeze". The chronic cough may be your only clue. Once we have your child's symptoms under control, we can then explore what may be causing the wheezing. It may "run in your family", or it could be seasonal, exercise-induced or allergy related. Some foods can cause your child to wheeze. We can test for food allergies in-house and have the results back ASAP. Food allergies are very serious and some such as peanuts, shellfish, and fish are life-threatening. We like to see children every 3 months if they have asthma. 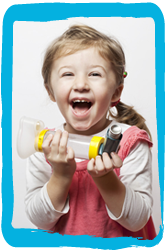 Children five years or older will have a "lung test" called a Spirometry done at least once a year. Our providers have a special interest in asthma and pride themselves on having a very low rate of hospitalizations of their asthma patients. So fill out the forms for asthma and allergies, bring them with you to your child's visit, and let's stop that chronic cough! Please visit the follwing websites for more information on asthma. As of March 1, 2013 we have in-house allergy testing. If you suspect your child is suffering from allergies, please complete the forms below, and bring them with you to your appointment. Your provider will discuss with you whether allergy testing and or shots are right for your child. The average allergy patient spends approximately ten times the amount of money on allergy over the counter medications,and prescriptions during their life than they would on Immunotherapy. Most insurance companies cover Allergy Immunotherapy as a patient insurance benefit. Clinical studies have indicated that Allergy Immunotherapy can greatly reduce the cost of treating allergies even when the cost of Immunotherapy was figured into the numbers. Clinical studies have indicated the some patients with allergies can be permanently desensitized from their allergies when taking Immunotherapy. Clinical studies have indicated that Allergy Immunotherapy has greatly reduced the severity and occurrence of asthmatic episodes. Allergy Immunotherapy is the only treatment that can alter the allergy disease process itself. Allergy Immunotherapy is the only treatment customized specifically for your allergies. In other words,you are not going to be medicated for things that do not cause an allergic reaction in your body. Allergy Immunotherapy has been proven to greatly reduce hospitalization in severe allergy patients. Allergy Immunotherapy has been a proven medical science for more than 100 years. Patients who have taken Immunotherapy as directed have reported to have as much an 85% satisfaction rate. Please visit the follwing websites for more information on allergies.